Before the Turkish invasion in 1974 Lysi, with more than 5000 inhabidants was the largest village in the Mesaoria plain of the Ammochostos (Famagusta) district. It is situated in halfway between Lefkosia (Nicosia) and Ammochostos, on the north side of the "new" Lefkosia-Ammochostos road. Lysi's most important football team, ASIL, was the first team in Cyprus with its own football field with grass. Lysi had its own Gymnasium (high-school) and Hospital. 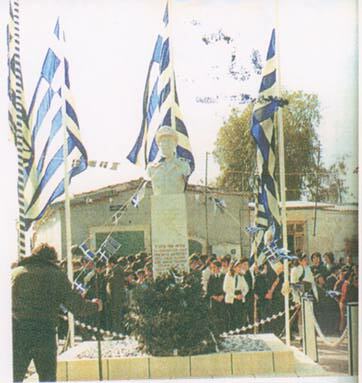 Lysi is the birthplace of many modern Greek Cypriot heros, who lost their life during the anticolonial struggle against the British rule in late 1950's. The most famous one is Grigoris Afxentiou who was the deputy leader of the military wing of EOKA (Εθνική Οργάνωσις Κυπριακού Αγώνος=National Organization of Cypriot Struggle). The British army, being unable to make him surrender, burned him alive in the cave he was hiding on March 3rd, 1957. 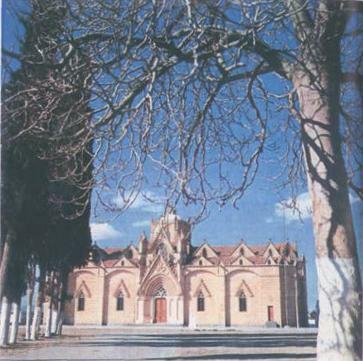 National day Celebration at "Grigoris Afxentiou Momument"
Late 19th century "Panayia's Church", covered in a thick layer of Gothic decoration copied from the great medieval cathedrals of Famagusta and Nicosia. 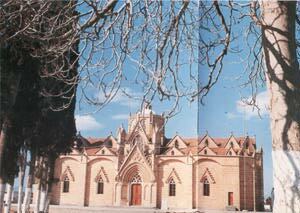 Another picture of the village's Church. Λυσιώτισσες. 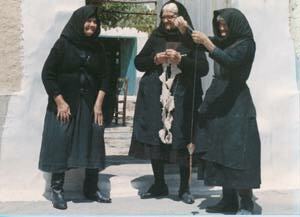 (Lysiotisses) Old women of Lysi, wearing the village's traditional costumes. The oldest one (on the left) wears boots and has her hair covered. The most modern one (the one in the middle) does not cover her hair completely and wears shoes. All the houses in Lysi had their outside walls painted white. 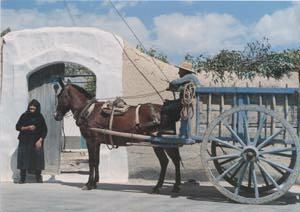 The carriage in the picture was the common transportation vehicle in agricultural areas of Cyprus until the independence in 1960. 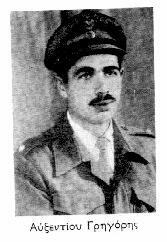 Grigoris Afxentiou (1928-1957), fighter during the Cypriot struggle for union with Greece. He was the deputy leader of the military wing of E.O.K.A. (Ethiniki Organosis Kypriakou Agonos = National Organization of Cypriot Struggle). His pseudonym during the struggle was Zedhros. He was born in 1928 in Lysi and he studied in the 'School of Reserve Officers. In Spring 1955, he participated in the bombing attack against the British-controlled Broadcasting Corporation in Lefkosia (Nicosia). The British authorities offered a bounty of 5,000 pounds for his arrest. On March 3rd, 1957 British soldiers burned him alive in the cave he was hiding, on a mountain side nearby the Machaeras monastery. Before their decision to burn him alive, he heroically resisted the repetitive attacks against his shelter for about ten hours.